As for being a desirable spot for a romantic getaway, few places rival the lovely seaside town of La Jolla. Indeed, its exquisite beaches and secluded coves have been a welcome refuge for lovers of all ages since the earliest days of the previous century. Located on Prospect Street in the heart of town, the Grande Colonial Hotel is the oldest original hotel in La Jolla and is on the registry of Historic Hotels of America. Since its opening in 1913, the hotel has become recognized as a place for all things romantic. A recent renovation which added 18 suites to its already existing 75 rooms has only increased the allure of the hotel for lovers desiring a respite from everyday life. In mid-June, this writer and a date spent a blissful 24 hours together in the Grande Colonial, staying in one of the new ocean view suites, and dining in the superb hotel restaurant, Nine-Ten. These days, the phrases “customer care” and “attention to detail” are tossed around like a home-delivered morning newspaper. And are just as frequently off-target, as well. Many service-related workers these days seem indifferent to the well-being of everyone except themselves. “Out of service” is more like it. Not true at the Grande Colonial Hotel and Nine-Ten restaurant. The cheerful and accommodating staffs of both establishments conversely, seem to truly enjoy their jobs. Guests are greeted with sincere smiles and genuine affirmations of welcome. Here, style and grace are the norm. The hotel itself is, in a word, beautiful. Its architecture and furnishings are elegant. The atmosphere is serene. Really, the place is an oasis of tranquility. Our suite was luxurious, yet understated. The kitchen not only had an oven and a small refrigerator, but also dishes, utensils and cookware. As well, bottled water, grapefruit, chocolates and other snacks were available. Gratis, no less. A short climb up a flight of steps led to a loft and library, complete with several literary classics, though, alas, no Hemingway. Still, the private deck with its stunning view of the ocean was a worthy consolation. Standard rooms at the Grande Colonial are also ideal for couples desiring comfort and privacy resplendent in a romantic atmosphere. 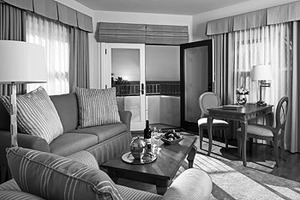 While the street-fronted rooms offer great views of Prospect and Girard Streets and their famous shops and restaurants - frequently called “the Rodeo Drive of San Diego” - the rear ocean view rooms are simply divine. Upon entering these rooms, guests not only receive the sensation of stepping back in time, but of desiring never to return to the present day. The feeling is magnified when said guests relax together in a bathtub of warm water and bath salts. Other tranquil spots in the hotel are the sitting room near the main lobby and the sun room which overlooks the handsome oval pool. The hotel garden areas are also lovely and peaceful. Open since July 2001, Nine-Ten, with its white table clothed dining room, ocean view terrace and al fresco dining features a menu consisting of California cuisine utilizing produce from local farmers. The menu, which is created daily, includes soups, salads, steaks and local fish selections. The wine list is extensive, while the dessert selections bring to mind Mae West’s famous quip, “I can resist everything, but temptation.” In all aspects, Jason Knob, Pastry Chef Amy O’Hara, and Food & Beverage Director Neal Wasserman and their staff have created an intimate, inviting atmosphere for fine dining that is exceptional in every way. The cozy and convivial Nine-Ten bar is worth a visit in itself, and not just for its excellent Happy Hour. In full, the Grande Colonial Hotel and its Nine-Ten restaurant personify romance. Both are truly grand indeed. Deluxe rooms are $255 to $500 per night. Deluxe suites are $339-$600 per night. Little Hotel By The Sea and Garden Terrace Suites are $375-$1500 per night. Reservations are recommended for Nine-Ten.